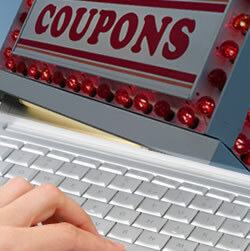 We all love to get discounts when shopping online, but beware what you click on. A 15-year old girl buying a present for her mom got sucked into a “coupon click fraud,” which lifts credit card information when shoppers click on a pop-up ad. The pop-up promises a $10 cash rebate from the retailer on your next purchase, but when you click on it, your credit card number is snatched, and you’re charged $12 a month for a so-called “membership” you never asked for, were not aware of, and don’t want. Internet merchant Shopper Discounts is behind the practice. The 15 year old girl who got duped by this deception is leading a federal class action suit against Webloyalty, which is the parent company of Shopper Discounts. “The uniform business practice at issue in this case is as simple as it is deceptive and devious,” the class claims. And apparently it’s not just the coupon company at fault, the retailer you’re buying from might also be complicit. The suit claims Webloyalty pays its retailer accomplices for signing up consumers. Another good reason to only make online purchases from a company you know and trust. This practice is another sleazy example of how consumers are being ripped off in the age of the internet. It’s time for the courts to stand up and stop these practices. Make the company pay this time! Click here to read more about this practice and the case on Courthouse News Service. Profiled By Your Credit Card Company?